Portable magnifying lamps - Delivered Australia wide. - Includes 3 dioptre 10 cm Glass Lens with a small 12 dioptre section closer inspection. (#CAPG005). Features: Desk top Magnifying Light. Glass lens with a diameter of 10 cm. Magnification is 1.75 times (3 dioptre). 12 dioptre (4 times Magnification) section in lens. Light source - 12 watt round Fluorescent globe. Warranty - 1 year cover. CAPG006B Flexible Magnifier with Light. CAPG008W Lamp. Beauty Salon preferred facial Light. 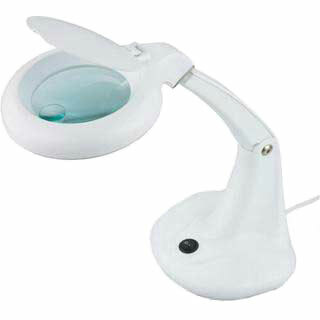 CAPG040 Magnifying Lamp with LED Lights. CAPG041 Magnifiers with LED Lights and large lens on Stand. CAPG070 Desk top Magnifier with Light. Can organise for Magnifying Lamp Australia wide delivery. Also via internet banking or cheque. * Desk top, Clamp and Stand alone Light units available.